9 Pandas on Top features 9 very different panda characters on 20 paylines, who will animate your reels in different ways to form winning combinations. It’s a really cute game with mini games that can be triggered during the main game! 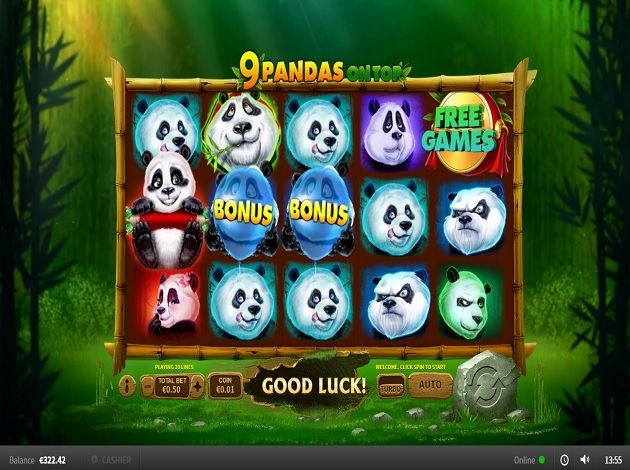 This panda-themed slot by Skywind Group comes with 5 reels and 3 rows and an RTP rate of 93.36%. It’s also a low-medium variance slot. In this game, your total bet is your chosen coin value bet multiplied by 50. The minimum bet amount is € 0.01, meaning a total bet of € 0.5 and the maximum amount is a total bet of € 250. The main features to look forward to are lucky pandas, a balloon-popping game and of course, free spins! The symbols on the reels are 9 different panda faces, including a pretty female panda with a flower on her head, a grumpy panda, a baby panda, a sleepy one, a panda chewing bamboo, a pink tinted panda with a bow, a panda holding a blue balloon and a smiling, happy panda among others. All the symbols on the reels are pandas, without any traditional symbols, so this game takes its pandas seriously and there’s nothing else but them in the game! The only exception is the free spins symbol, which is a title symbol with green leaves. The panda hanging on a red scroll is the Wild, whose scroll will roll down revealing the ‘Wild’ title. This substitutes for all symbols except for the free spins and the balloon bonus symbols. The panda holding the blue balloon is the bonus symbol in the game. If you land 3 of these symbols anywhere on the middle 3 reels, you activate the fun Big Panda Booms round, a balloon-popping game where all you have to do is pick a balloon for the panda holding it to pop, revealing a multiplier prize. You can keep popping until you hit the exterminate balloon, which will end the round. On any random spin, any panda can also be a lucky panda, climbing on top of the bamboo reels and turning a number of pandas into itself to increase the chances of forming winning combinations. The free games symbol appears on reels 1, 3, and 5. Landing 3 free games symbol anywhere on these 3 reels will earn you 12 moonlight free spins. The lucky panda also appears more frequently with higher-value pandas, increasing the value of your wins! Even better, free spins can be retriggered during the round. The yellow and green lit pandas are the highest paying symbols on the reels, earning you 600 coins for a hit of 5 on a payline. The pink, dark blue and light blue lit pandas will pay 400 coins for 5 of a kind on a payline while the 4 other pandas have a maximum prize of 200 coins for 5 of a kind. The Big Panda Booms bonus also has a really high winning potential, with mega prizes of up to 2000x your bet to be won if you pop the right balloon! If you’re lucky enough to miss the exterminate balloon, you can keep popping and earning amazing prizes for as long as you can! Set against a bright green rainforest, the reels are made up of bamboo sticks and leaves. The graphics are simple but original and surprisingly detailed: every panda on the reel will react to the result of each spin, sighing in disappointment if there’s no win and rejoicing with ‘oohs’ and ‘aahs’ when a winning combination is made. The stone slab on the right is the spin button which gets the reels going and in front of it, you can choose the turbo spin option or the auto spin option. On the left, you can adjust your total bet as well as press the information button to access the paytable. This panda themed slot is not only cute but also really fun to play. The reels are full of animations and sounds and features are activated relatively often, so there’s always a surprise waiting for you around the corner in 9 Pandas on Top. Great graphics, great features, and great prizes: there’s no reason not to love this game! Skywind Group is an entertainment technology solution provider whose services cover everything from mobile to desktop, both online and offline. Established in 2012 by Teddy Sagi, Skywind has grown along with its partners and customers by supplying them with the technology and distribution means that have led to their growth and success. They have an exclusive distribution partnership with Playtech, one of the most successful operators in the business. Skywind itself might not be the most well-known name in the industry, but that’s mainly because most of their games run on Playtech software, so you won’t see their name on each and every game. Skywind has produced an impressive variety of slot machines with over 30 different titles, with different themes and playing experiences to suit all tastes. What their games have in common are, without a doubt, the detailed graphics, creative design, and innovative features to keep things interesting for the player. Most of their video slots follow the 5-reel format but occasionally they change things round and do something completely different. For example, arcade games like Fu Fish involve skill and decision-making on the part of the player, making games like these very interactive and also radically different to what video slot players are used to. Besides creating some very popular slot machines, they’ve also made a name for themselves as one of the most trusted and valuable partners in the gaming industry, thanks to their ability to supply clients with a wide variety of specialised software and distribution solutions. The games we offer by Skywind Group are Top Cup Day, Respin Mania and Gem King.